The parents of fifth-grade students at Mary Moore Elementary school in Arlington, Texas, painted bathroom stalls with uplifting messages and inspirational quotes. 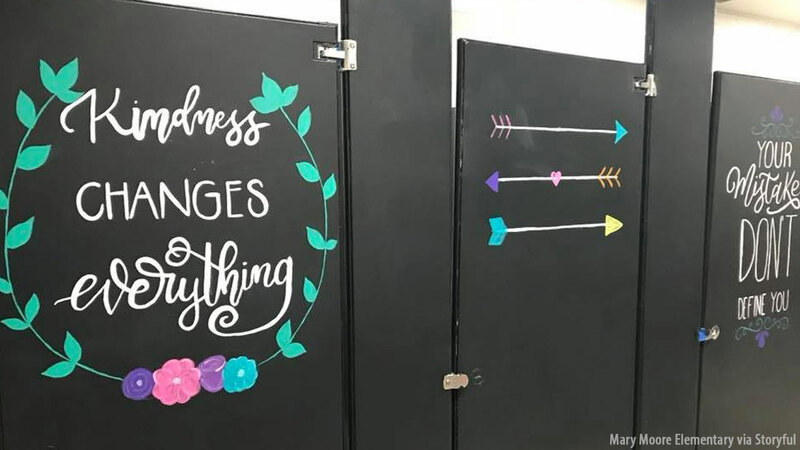 Mothers of fifth-grade students at Mary Moore Elementary school in Arlington, Texas, painted bathroom stalls with uplifting messages and inspirational quotes. The mission of the parents was to spread "love, kindness, and positivity" throughout the campus. The mothers spent more than 37 hours earlier this month to paint the stalls, including sanding, painting the doors black, and writing the messages. Phrases displayed on the door include, "your mistakes don't define you," "kindness changes everything," and "she believed she could so she did." The school's principal, Tyson Jones, says the students have "taken a sense of pride and ownership, and have nothing but exciting things to say" since seeing the artwork.